SÁBADOS MAÑANA 10 REST COUNTRYS NOT FREE. ONLY UE COUNTRYS (NOT ISLANDS). PORTUGAL (NOT ISLANDS). AUSTRIA,BENELUX,FRANCE,GERMANY. Here we have a genuine CORGI diecast piece. BUY-IT-NOW for this sensible price. Just wait for/request the invoice! Clean, bright and still solid. 100% complete. Early 'MADE IN GT. BRITAIN set. Don't worry though - I wont rip you off. Austin Mini Mk3 Cooper Citron Green LGB G 1:24 Scale Diecast Detailed Model. Opening side doors reveal a detailed interior, opening bonnet reveals prototypical engine! Matchbox Austin Mini Cooper taxi exclusivo de EE. UU. 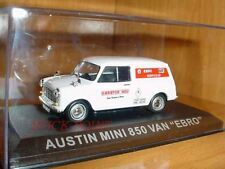 AUSTIN MINI VAN 850 1:43 "EBRO" MINT WITH BOX!!! RARE 1:43 AUSTIN MINI 850 VAN "EBRO" . Mint condition IN BOX. From the "Furgonetas de antaño" spanish collection. Few units made. Good luck! 186&cat=100119. PUEDE VER MAS DE MIS COLECCIONES EN VENTA. ENVIOS NACIONALES ( SOLO PENINSULA Y BALEARES ). TO SWITZERLAND AND ISLANDS. AUSTIN MINI 850 VAN EBRO, Fabricado en escala 1/43. 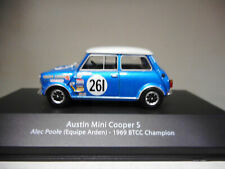 AUSTIN MINI 850 VAN EBRO, Manufactured in 1/43. IXO - ALTAYA The item is new in box. CHECK-OUT PAGE. ARTÍCULO CON SU BLISTER ORIGINAL. HASTA 2 KILOS. HASTA 1 KILO. HASTA 0,5 Kilos. TARIFAS RESTO DEL MUNDO. REST OF THE WORLD. ENVIOS RESTO DEL MUNDO. ENVÍOS A PORTUGAL. Austin Mini Mk1 Cooper LGB G 1:24 Scale Diecast Detailed Model with roof mounted surfboard! Size approx. 140 x 70 x 75mm. Opening side doors reveal a detailed interior, opening bonnet reveals prototypical engine! Vintage Corgi Austin Mini Van En Azul No 450 G.C. CORGI AUSTIN MINI VAN. THE MODEL IS IN GOOD REPAINTED CONDITION. Matchbox. 64 Austin Mini Cooper. señor Bean. exclusivamente para Asda. 2017. Protector. 64 Austin Mini Cooper. Exclusively For Asda. Box: Very Good, all original. Slight age and storage related wear to corners and edges, a little grubby and a few marks. Inner tray present, slightly pressed down due to weight of model sitting on it over the years. 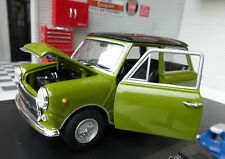 Hard to find model, Matchbox 1964 Austin Mini Cooper S with green body and black bonnet like the TV series Mr Beans car. 1/51st scale and 60mm long, made in Thailand. CONDITION: COMPLETE WITH ALL WHEELS & TYRES, MISSING REAR DOORS, PLAYWORN. IDEAL RESTORATION PROJECT. Vanguards VA13000 Austin Mini 7, 1/43, MIB! Item: 51 100 - Vanguards VA13000 Austin 7 Mini- Green. Notes: From a good collection of 1/43 scale, Mini's by Corgi, Vanguards, Solido etc. All mint/boxed. No old cereal boxes or jiffy bag fom us! 1:43 SCALE MODEL PRODUCED BY HORNBY/CORGI, AS PART OF THE VANGUARDS COLLECTION. THE MODEL IS MINT, AND BOXED. Corgi 450 Austin Mini Van Original playworn ligeramente pero todavía muy agradable van!!! Schuco Piccolo Austin Mini IAA 1997. für Rover Deutschland. Mini - Paul Smith. Collectors item not suitable for children under 14. Box Size 15cm x 6.5cm x 6.5cm. Ref 341 de 1968, made un England, Série éphémére avec jantes démontables à l'aide d'un petit vérin (qui fait krik stabilisateur) vers chaque roue. CARE : BOXE IS A ARTISANAL REMAKE. Been in my dads loft for over 30 years. Model - 1961 Austin Mini Cooper. Scale - 1:43. The Minivan gets a coat of deep blue and a few changes to the rear doors and interior panel, Police transfers and a police dog handler plus dog in this set. Corgi also added a lead which is missing here. Captain Scarlet. A lovely detailed model. This item would make an excellent addition to your collection and a fantastic display piece. 1/43rd Scale. 1/24th Scale. 1/18th Scale. 1/32nd Scale. 1/76 'OO' Scale. AUSTIN COOPER 24ct Cold Plated. 50th Anniversary Die Cast Model. Zur weiteren Klärung der Rückgabe kann sich der Kunde gerne mit dem Verkäufer in Verbindung setzen. Material: Kunststoff. Inselzuschlag national und international 10 EUR. Limited Edition - Nr. auf der Rückseite. 1x 1:43 Modellauto 400 g. 1x 1:18 Modellauto 1,8 kg. Belgien, Dänemark, Frankreich, Großbritannien GB, Irland, Italien, Luxemburg, Niederlande, Polen, Portugal, Schweden, Spanien. Alles rund um Motorsport und Modellautos. Oxford Diecast MIN016. Austin Mini silver with just married graphics. This again varies depending on location and size and total weight. Bank cashing cost this end. 1/43 Austin Morris Mini Van 'Enfield Freno & Embrague" vanguardias"
It is made by Vanguards and is 1:43 scale (approx. 7cm / 2.8in long). Austin Mini Cooper S. Non si accettano permute.